As you know, on HiggsHunters we have been giving you not just real data images from the ATLAS detector. 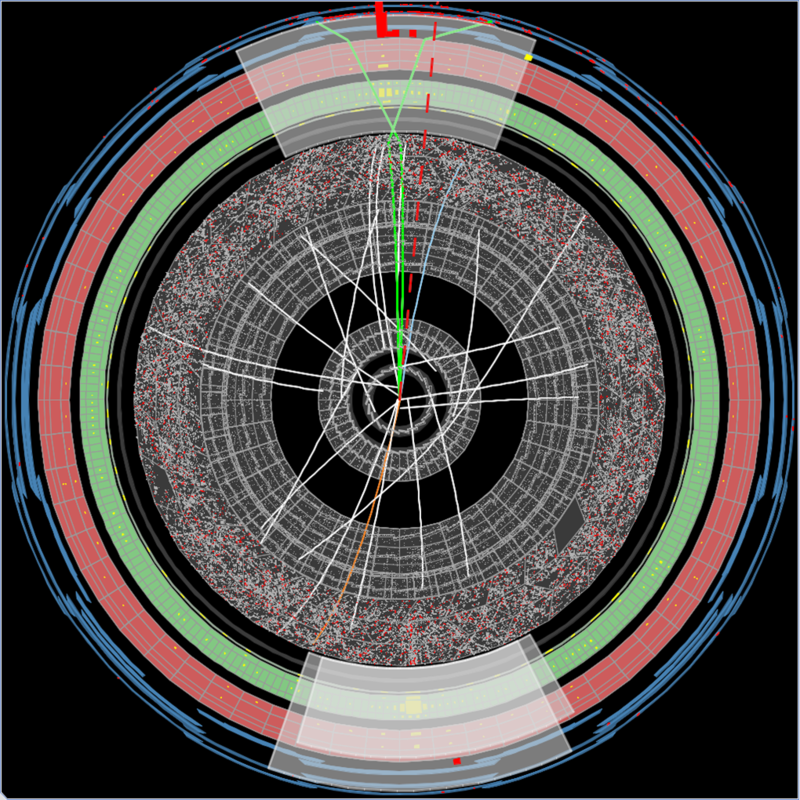 We have also been showing simulated images of what ATLAS detector events would look like if the Standard Model were extended with various new particles and interactions that would give displaced vertices. So what are these simulations of exactly, and why are they important for the science at HiggsHunters? mass of either 8, 20, or 50 GeV. Recall the Higgs boson mass is 125 GeV, so we need the “a” boson mass to be less than half the Higgs boson mass if the Higgs boson is to decay to a pair of “a” bosons. 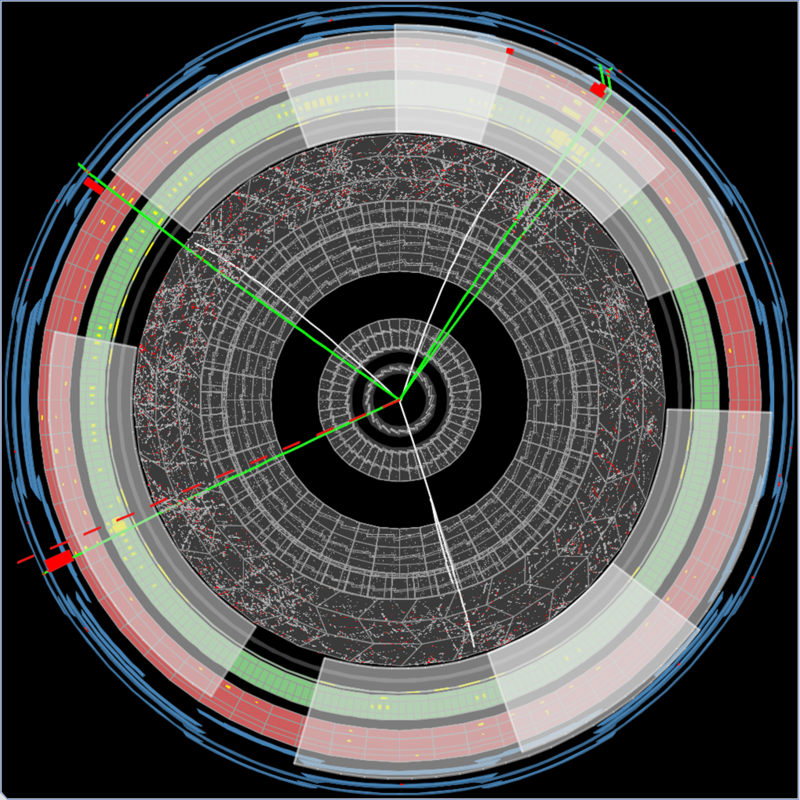 “a” boson decays to either a pair of bottom quarks (for an “a” mass of 20 or 50 GeV) or tau leptons (for an “a” mass of 8 GeV). This is based on the expectation that Higgs-like bosons usually decay to pairs of heavy SM particles more often, since they couple to mass. This gives us 3×2+3×1=9 possible parameter combinations to simulate. We present a roughly equal number of all 9 on HiggsHunters. 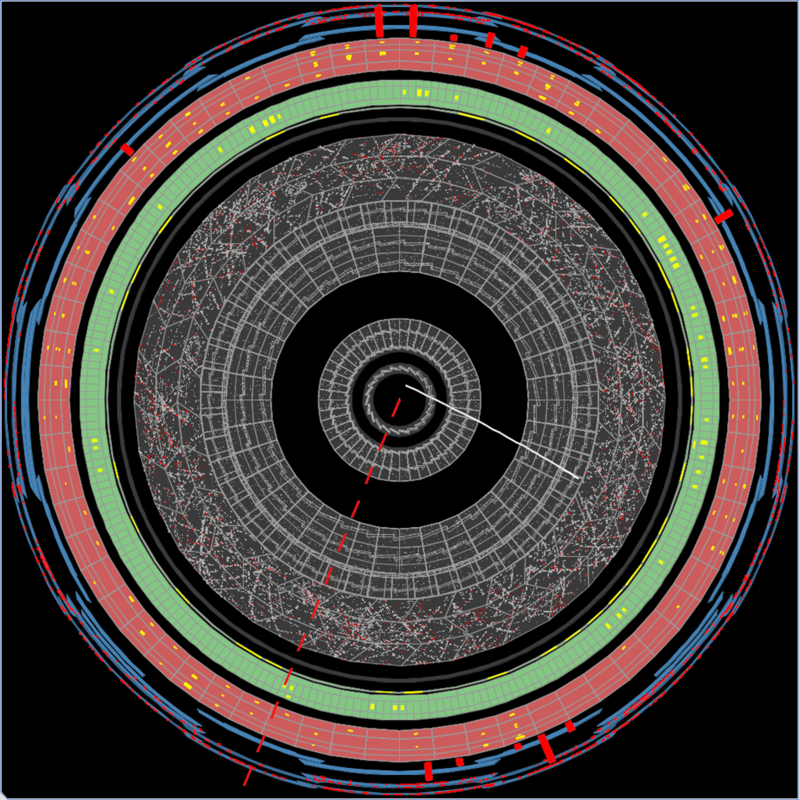 Below is an image of an event simulated with the parameters: “a” mass = 20 GeV, “a” decay to a pair of bottom quarks, and “a” lifetime = 100 mm. Since this is a simulation, we know where the decays took place – they are drawn on the image as pink dots. 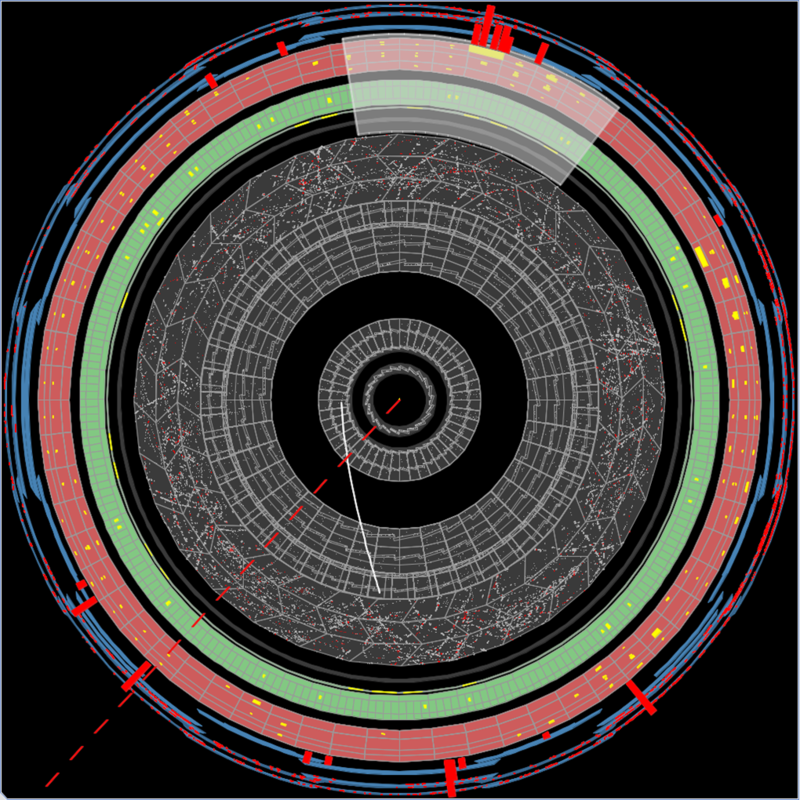 If you all manage to find evidence for some new particle giving displaced decays, we need to know how often this process is occurring in the LHC pp collisions. (Well, we would also need to celebrate with some Champagne first!) How often it happens is given by how often you see it happening divided by your efficiency to see it happen. It is this efficiency which we can measure using the simulations, for each set of model parameters. That’s it! Be proud that your abilities have been calibrated, and you are now ready to tackle the larger sets of real data we plan to upload to the site soon! Since you’ve all been diligently classifying for over a week (and doing a fantastic job! ), we from the science team thought we should explain to you all a bit more about the physics you’re looking at and what these events are! 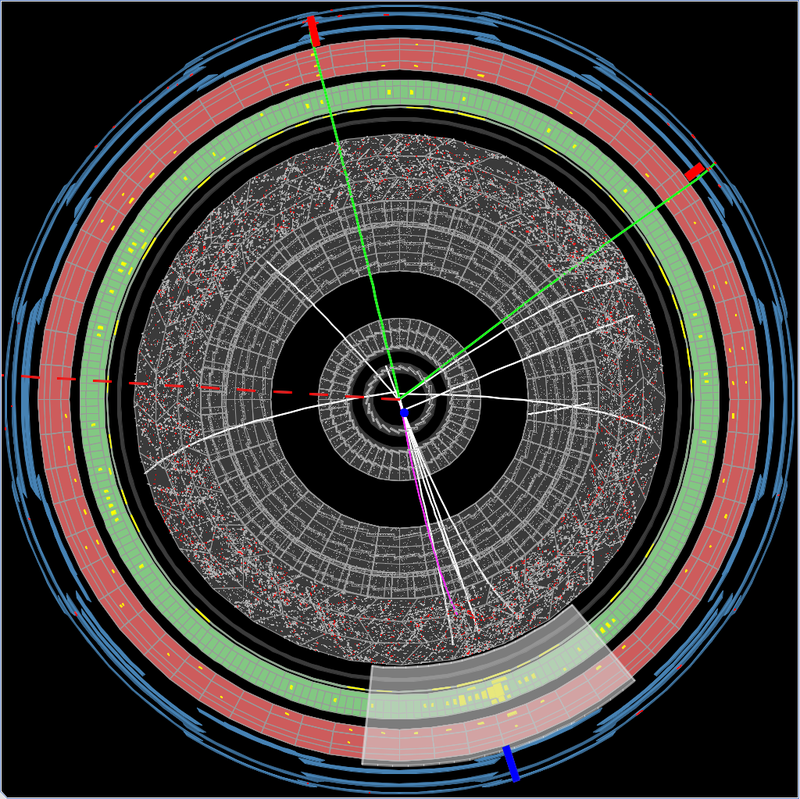 How do we go from the 20 million proton bunch collisions each second happening inside the ATLAS detector in 2012 to the images on your screens? 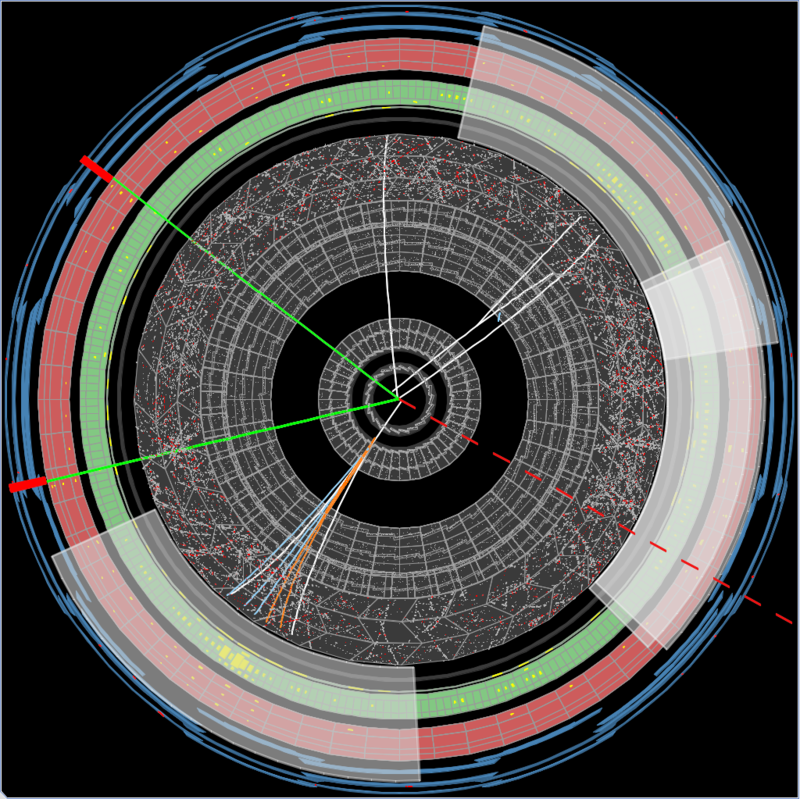 First, remember we’re trying to find exotic decays of the Higgs boson. 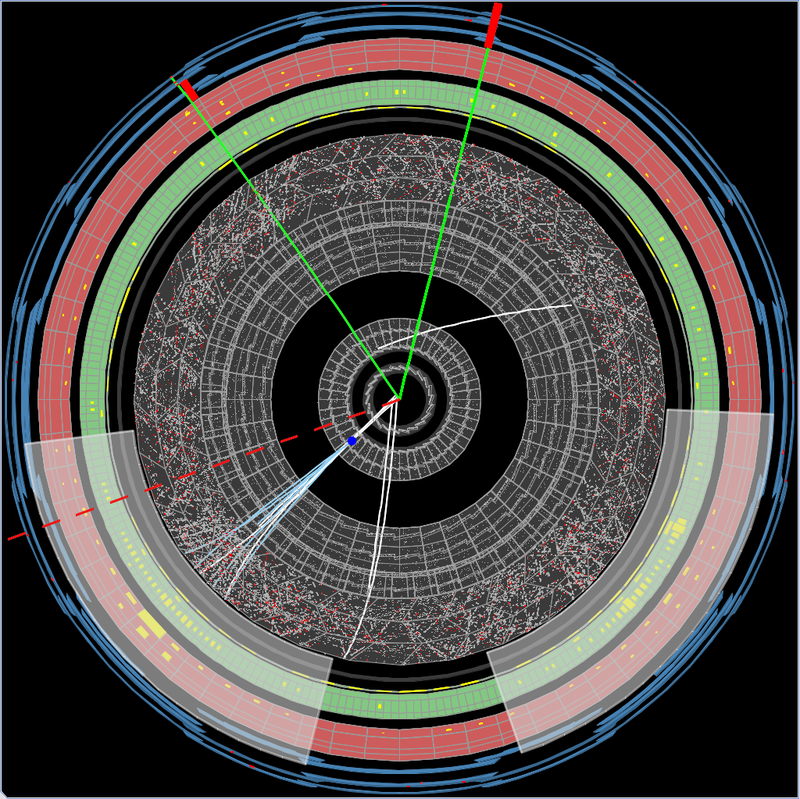 If you just chose random collisions, you’d have just about a 1 out of 10 billion chance of picking one with a Higgs decay in it! 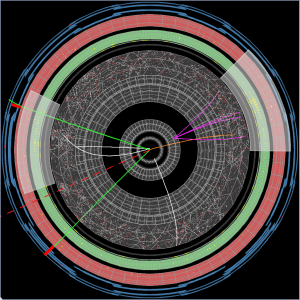 So we need to select events (proton bunch collisions) which are enriched in Higgs bosons. 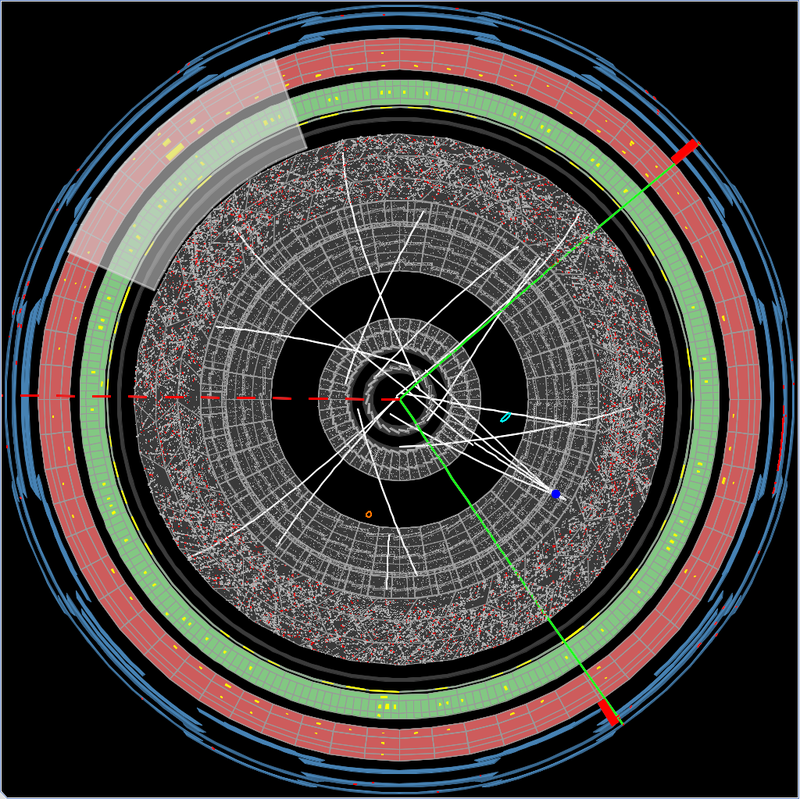 Most of the time, the Higgs is produced by itself, and then decays. Unless you know what it is decaying to and can select on that, you have no way of enriching the sample. 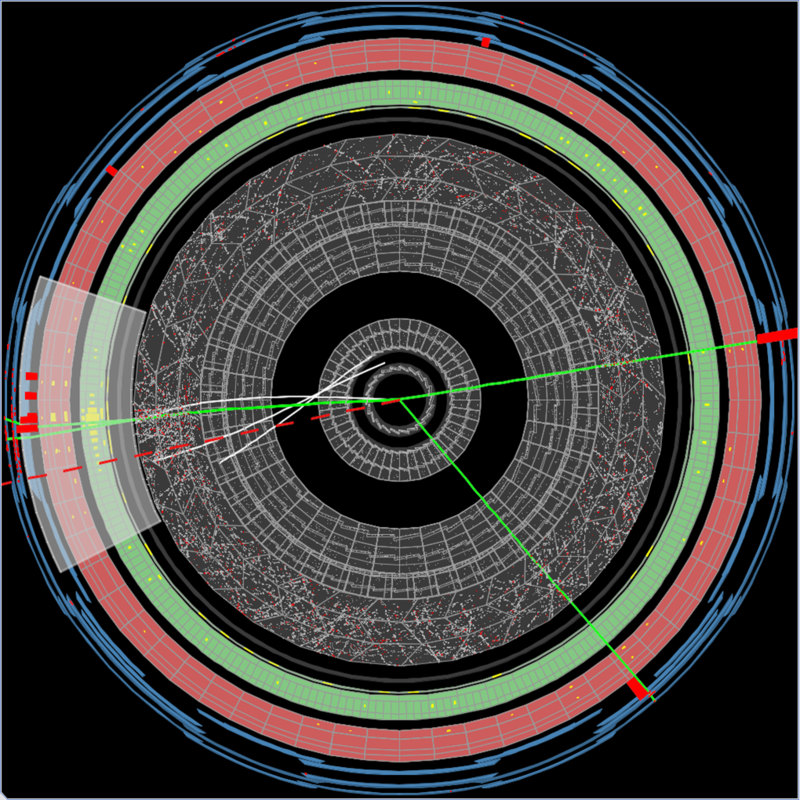 (This works for many SM Higgs searches/measurements, e.g. 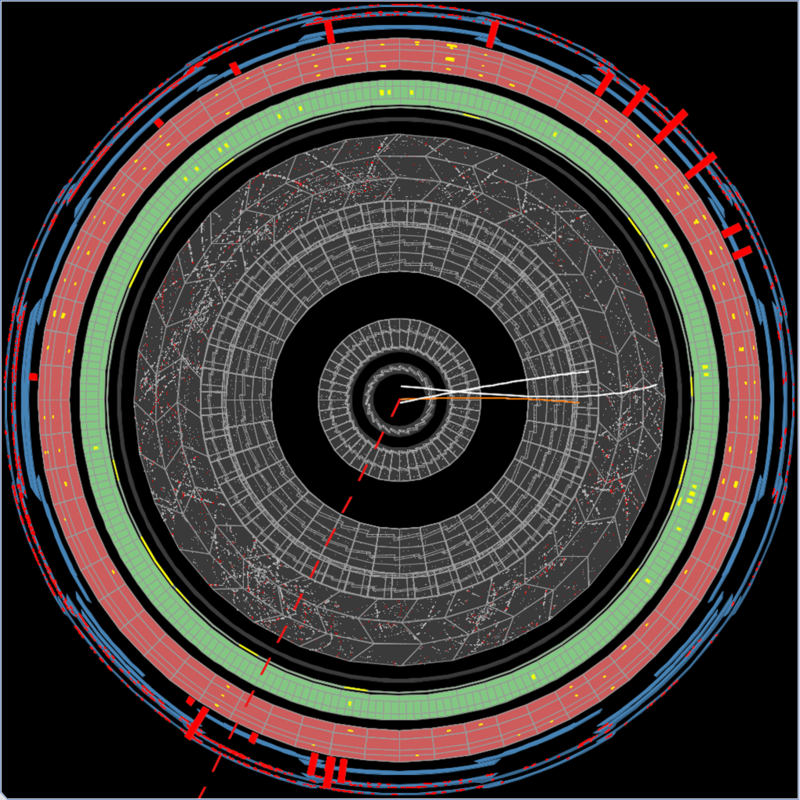 where its decays to photons or Z bosons can be selected.) 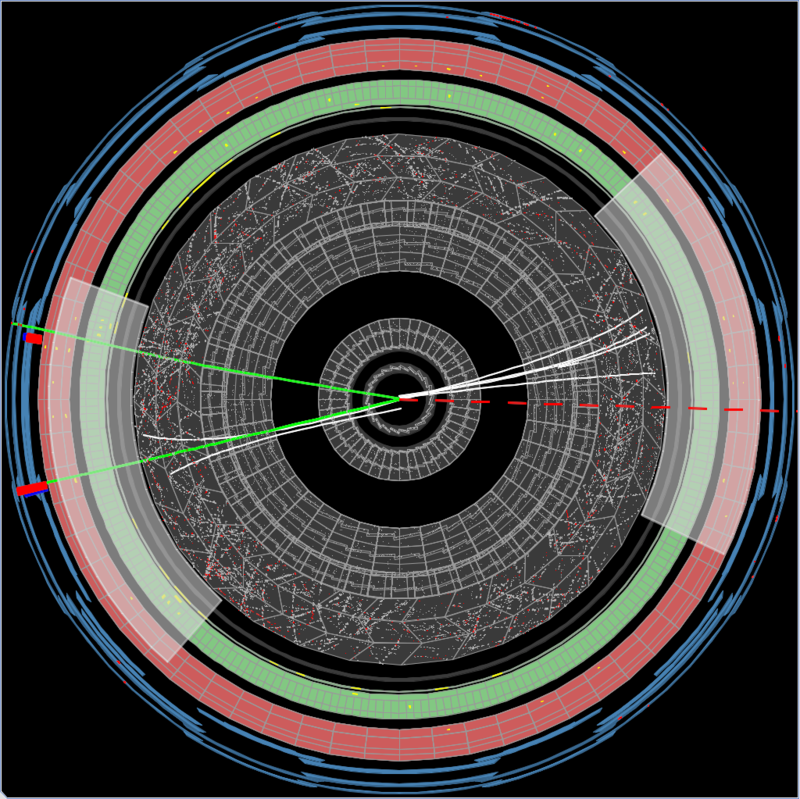 We chose a method that is blind to what the Higgs decays to, thus letting us potentially see any new exotic decay. 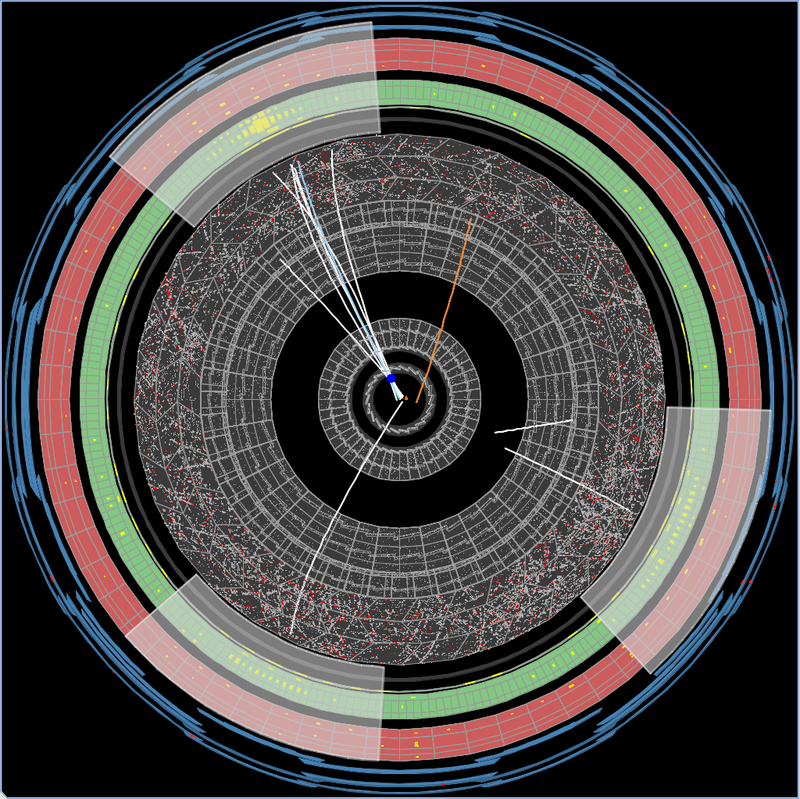 About 2% the time, the Higgs boson is produced along with a Z boson, in the same event (according to the SM calculations). 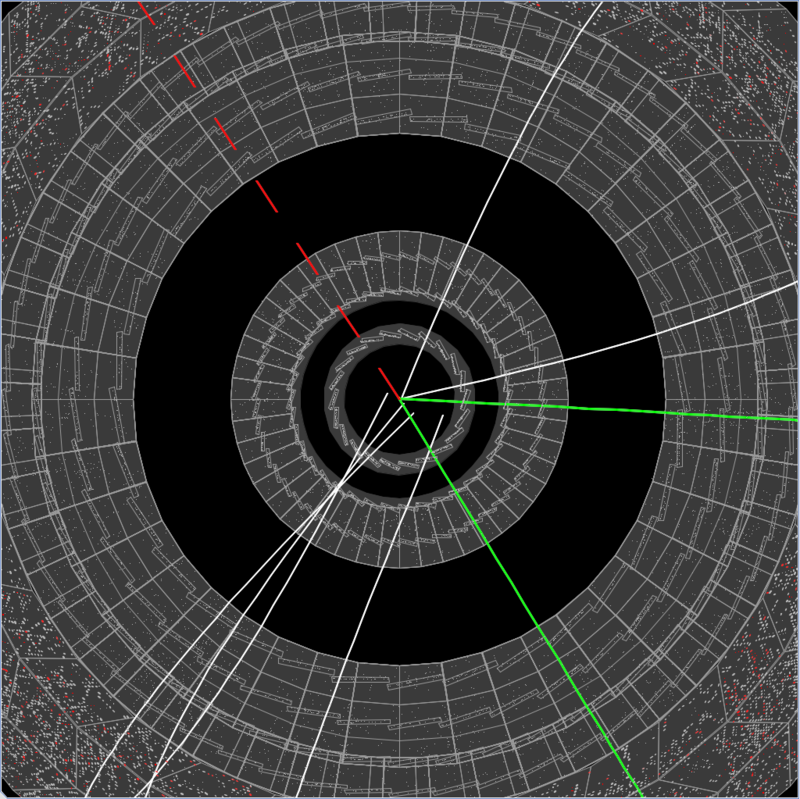 About 3.3% of the time, this Z boson decays to a pair of muons. 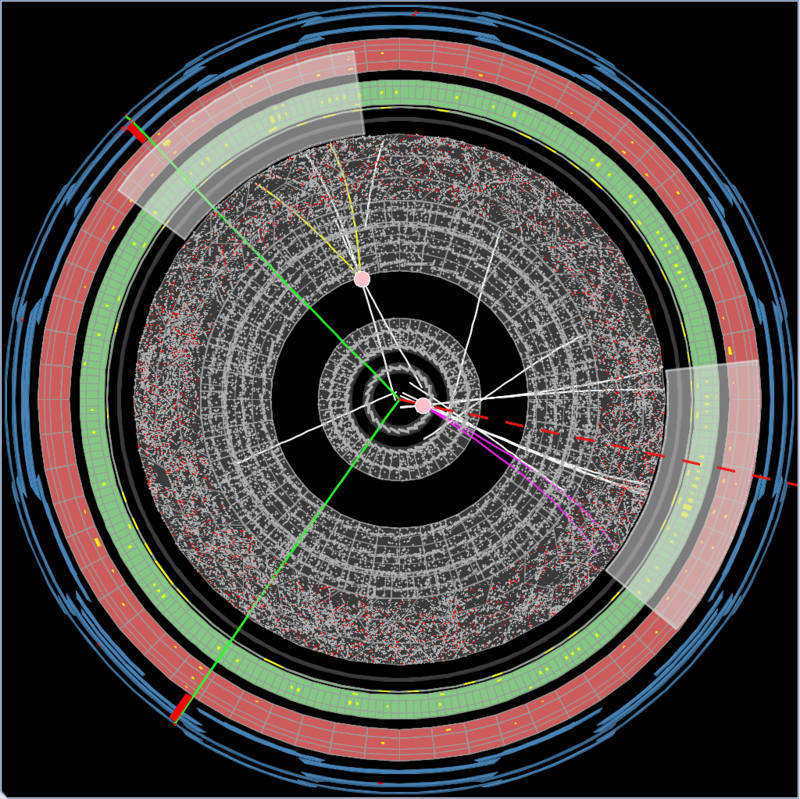 We select this 0.07% of Higgs bosons using the di-muon trigger and record them. There should be about ~150 events like this in our 2012 data (with 2 muons with transverse momentum above 20 GeV/c and |eta|<2.5 and dimuon invariant mass within 20 GeV of the Z boson mass). Unfortunately, these 150 events are accompanied by ~4 million events that just have a Z decay to two muons and no Higgs boson! 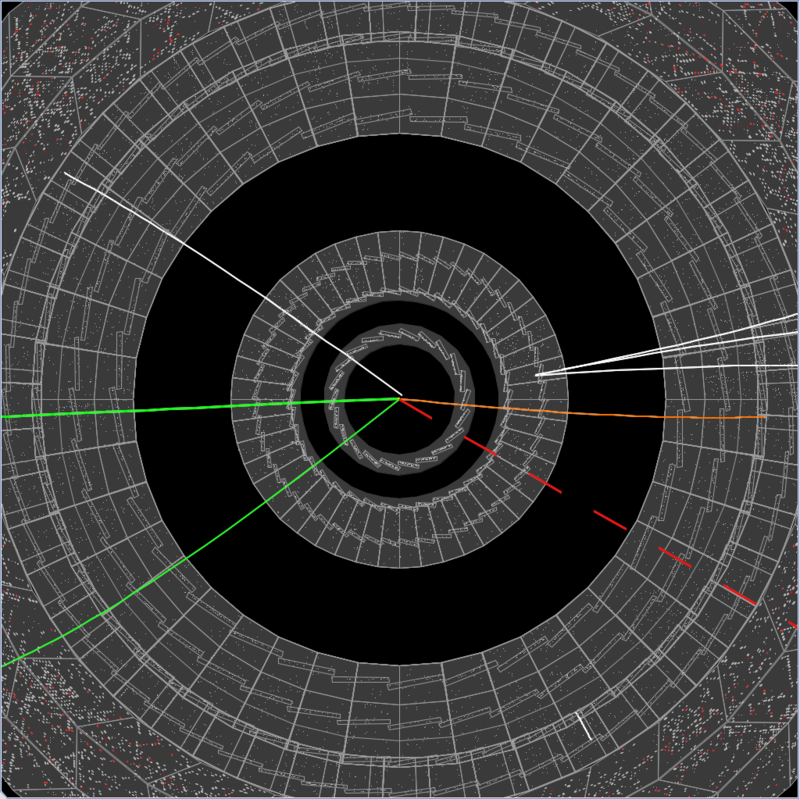 To improve our chances of having a Higgs, we use another trick – require the Z to be moving away from the beamline. 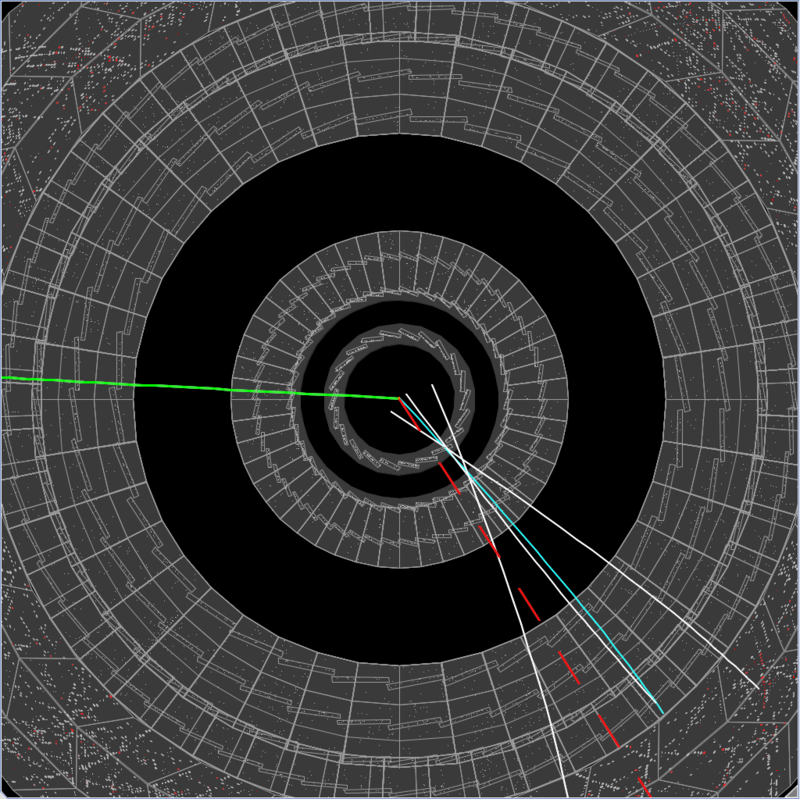 If there’s a Higgs and a Z, they tend to move away from each other in opposite directions. A Z by itself tends to go almost nowhere. By asking that the Z has a transverse momentum above 60 GeV/c, just 5% of lonely Z events survive, but we retain 60% of the 150 Z+Higgs events, so 90 left out of 200k Z background. (Not bad, we’ve gone from about 1 / 10 billion to about 1 / 2000!) Finally, we enhance the chance of something interesting going on by asking for missing transverse momentum above 40 GeV/c. This means that some particles have escaped without interacting (like neutrinos, or dark matter! ), or some of the particles were mismeasured. 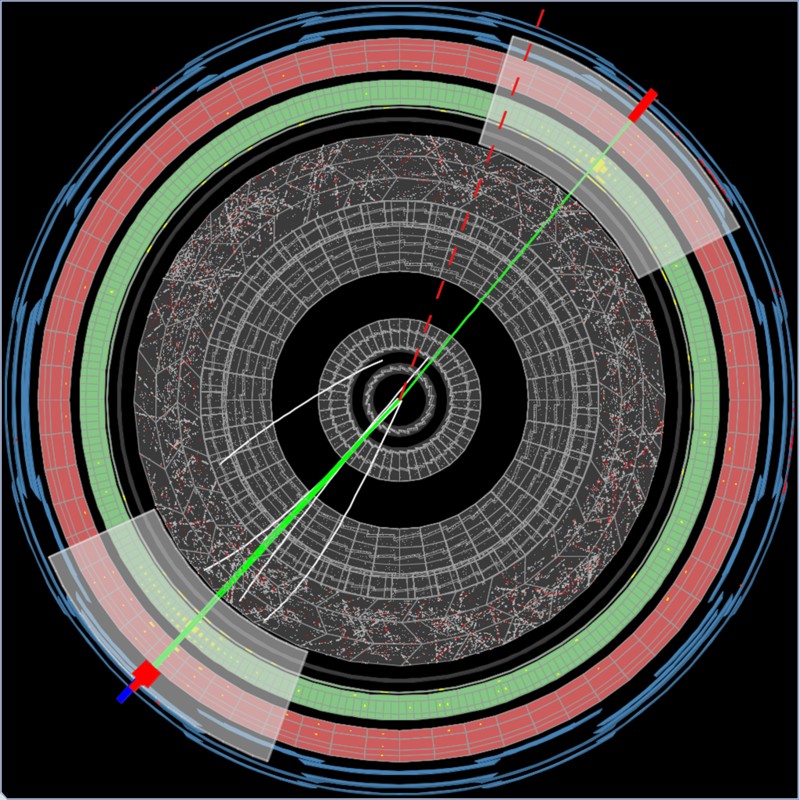 This leaves us finally with 50 Z+Higgs events if the Higgs decays to long-lived particles which themselves decay to pairs of bottom quarks or tau leptons (more on our simulations and models later!) and “just” ~50,000 Z events for you all to search through to find them (along with those simulations). Now that the events are selected, we have to reconstruct those displaced tracks! 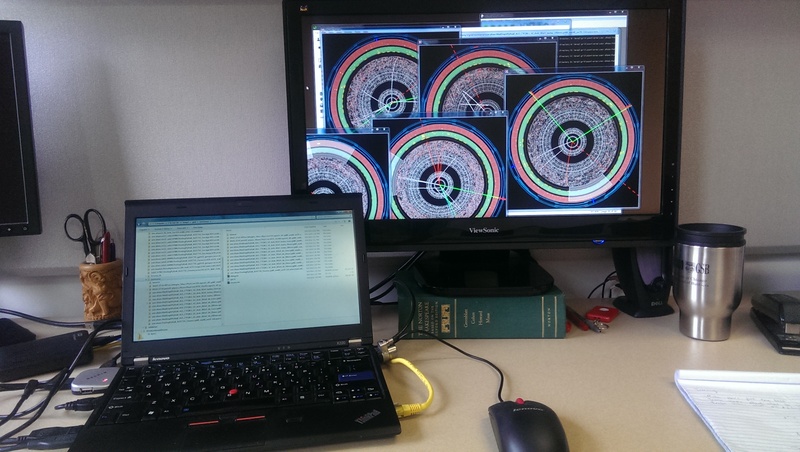 To do this, we save all events with a Z decaying to muons in a format that has all tracker hits saved (those thousands of little dots in the tracker pictures). Standard ATLAS tracking only reconstructs tracks that start from within 10 mm of the collision point, but for this study we reconstruct track paths that start up to 10 cm from the collision point. We also run a custom vertexing algorithm which attempts to find displaced vertices (hence the colored tracks and little ovals). But we hope you will do better! Reconstructing the data with these settings is slow… it takes about 10 minutes on average per event! For 50,000 events, that’s ~1 year of CPU time. Of course, we are clever and split the work up over hundreds of machines as part of the “world wide grid”, so is just takes a couple days. Finally, we download all the reconstructed data (about ~250 GB, from 5 MB per event) and make these wonderful pictures! This process happens on a machine in my office (see below). 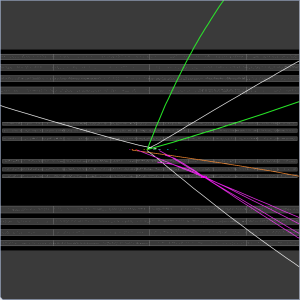 Running several instances in parallel, I can make about 1 image each second, which lets me finish all 50,000 overnight. Not everything is being shown in the pictures. We cut down the information so you can ignore the boring stuff and more easily see displaced vertices. We only draw tracks with transverse momentum above 2 GeV/c, which start at least 0.5 mm from the collision point. (Most particles come directly from the collision point, and are low momentum.) We also don’t draw tracks that start more than 20 cm from the center of the detector or the selected collision point in the direction along the beamline. To cut down on fake tracks, they must have at least 7 hits in the silicon strip tracker. Vertices shown must have at least 3 tracks. Muon tracks must have transverse momentum above 10 GeV/c, and jets of hadrons must have transverse momentum above 40 GeV/c. 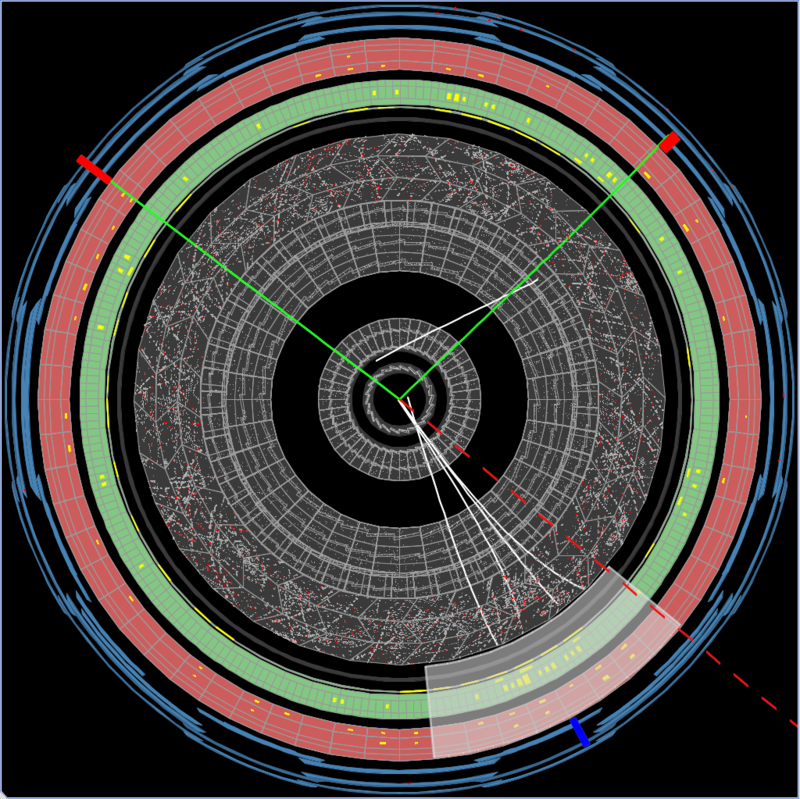 Other objects (photons, electrons, bottom quark jets, etc.) are drawn as long as they have transverse momentum above 5 GeV/c. Once done, they’re zipped up and sent to the Higgs Hunters site!